"The G3 delivers a wide range of tonal choices, from trebly rear pickup clank to warm, cotton-wool thickness." "Clean, it sounds quite twangy and bell-like, but with a huge amount of guts behind it. Live, it projects into the audience without any mushiness - you can always hear it, which is so important. Solid as a rock." Pere plays guitar with 'metal meets drum'n'bass' outfit Pendulum. 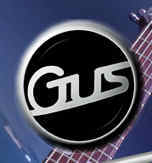 He's been a Gus owner since the 'early' days - in fact he owns G1 002! Originally a Diamond White Hardtail, I converted it to full Vibrato specification and sprayed it authentic Austin Healey Racing Green for him. 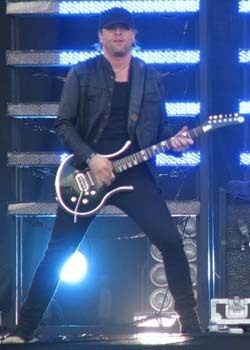 Over the years he's used the guitar for a wide variety of duties, including touring the world with Natalie Imbruglia in the late '90s with brother Rej (a Gus G3 Four player). Pere is an extremely gifted player who thrives on music whatever form it's served up in! A few years back in a 'GusGoss' interview we asked him what he did when not playing music - his reply "Sorry, I don't understand the question!!! ", just about summed it up really!